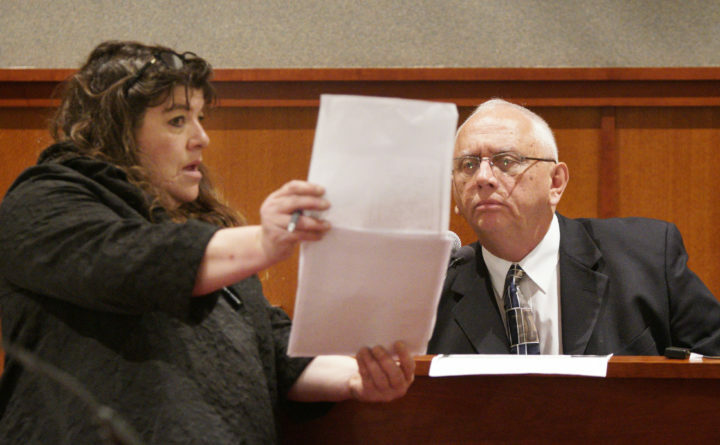 Amy Fairfield, attorney for Anthony Sanborn, reviews a document with James Daniels during the second day of a post-conviction review on Wednesday, October 11, 2017, at the Cumberland County Courthouse in Portland for Anthony Sanborn, who was convicted for the 1989 murder of Jessica Briggs. Data from the Maine Indigent Legal Services Commission show Fairfield was the highest-billing attorney who accepted low-income clients in need of legal representation. AUGUSTA, Maine — Maine’s often-embattled and unique system for providing legal representation to indigent people accused of crimes lacks safeguards guaranteeing financial oversight and quality, according to a report for the Legislature released Thursday. The Commission on Indigent Legal Services was formed in 2009 to provide defense lawyers to represent poor clients in court. Maine is the only state without a public defender’s office, according to Reuters. The commission ran out of money in its first years, and its hourly fees for private attorneys — capped at $60 with exceptions — have been assailed as too low. The commission’s staff of three oversees a roster of nearly 600 attorneys per year in 47 courthouses, and the caseload for these attorneys surpassed 30,000 in the 2018 fiscal year. Many lawmakers, attorneys and legislators see it as an inadequately funded patchwork. That view was borne out by a critical study on the system from the Sixth Amendment Center presented to the Legislature’s Judiciary Committee on Thursday. It recommends changes to the system, including raising hourly fees to $100 and paying more for murder and other cases. The group cited a lack of oversight that leaves “serious concerns” about potential overbilling, inadequate performance by some attorneys, and potential conflicts of interest in assigning attorneys and financial screening of clients as main issues with the system — all exacerbated by the commission’s small staff, the report found. “Given this fact, it should not at all be surprising that we found issues in both the quality and financial oversight of indigent defense services,” said David Carroll, the executive director of the Sixth Amendment Center. In the past fiscal year, 25 lawyers billed more than $124,800, the amount equaling the $60 cap multiplied by a 40-hour work week and 52 weeks in a year. Carroll said “overbilling” was a concern cited by lawyers and judges during the study. Seven lawyers exceeded that threshold on average during the past five fiscal years. One sheriff in the study estimated that 25 percent of assigned attorneys don’t visit clients in jail to prepare cases. A judge said a tenth of appointed attorneys withdraw or take a reduced role if a case goes to trial. One lawyer who billed $172,000 in a year never recorded a jail visit. The report also cited conflicts of interest in parts of the state. In a lawyer-of-the-day program in Somerset County, contracted attorneys could reject a defendant for appointed counsel, then take his or her case privately. In Cumberland County, a hiring freeze left financial screening positions vacant, leaving that duty to attorneys for the day. The Legislature ordered the Sixth Amendment Center study in 2018, and it’s unclear what the next steps will be. Former Gov. Paul LePage repeatedly proposed a public defender’s office that went nowhere in the Legislature. Rep. Barbara Cardone, D-Bangor, a Judiciary Committee member, has submitted a bill that would implement the study’s recommendations. “Even more than ponying up money, we’ve got to take a radical step in the way we look at these services and the quality of these services,” Cardone said in the hearing. John Pelletier, the commission’s executive director, declined comment after the hearing, saying he hadn’t had time to thoroughly review the report. But in a letter to another committee responding to allegations from Sen. Lisa Keim, R-Dixfield, Pelletier said the commission has had rostered lawyers review some high bills since the study kicked off and one flagged double-billing in one instance. The commission found no evidence of fraud. While the report did not mention attorney names, data provided by the commission to the Bangor Daily News in a recent records request showed that the highest-billing attorney over five years was Amy Fairfield, who runs a Lyman-based firm and recorded nearly $1.2 million — nearly $400,000 more than the next-highest total. She said about a quarter of the money in bills attributed to her in 2018 went to her and the rest was spread around to other lawyers in and out of her office. She also handled the complex case of Anthony Sanborn, a convicted murderer who maintained innocence and was released from prison in 2017 and said she works more than 40 weekly hours. “Quite frankly, 40 hours a week would be a vacation,” she said.